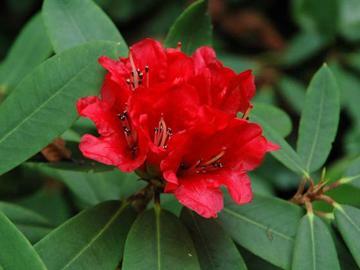 Large evergreen shrub with narrowly elliptic to lance-shaped dark green leaves, glaucous underneath and reddish brown bark. Trusses of fleshy, usually bright scarlet-red flowers in mid and late spring, sometimes repeating late (or early) in the season. Will grow in full sun. From China, Tibet and Burma. 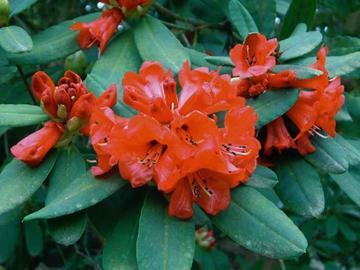 First discovered by Abbé Delavay and introduced by George Forrest in 1910.